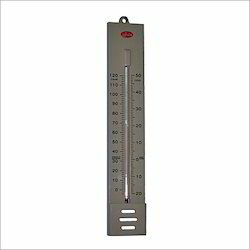 Wall hanging thermometers for Room Thermometer temperature comprises of red spirit filled magnifying lens tube on polystyrene frame with black markings & figures, scale length 120mm. We are looking for bulk query only. Specifications: Wall Hanging thermometers for Room temperature Comprises of red spirit filled magnifying lens tube on polystyrene frame with black markings Figures, Scale length 120 mm.